News media must do a better job of diversifying newsrooms and also reaching out to cover diverse communities, according to a panel of journalists, students and professionals at a Society of Professional Journalists panel discussion at DePaul University on Thursday. 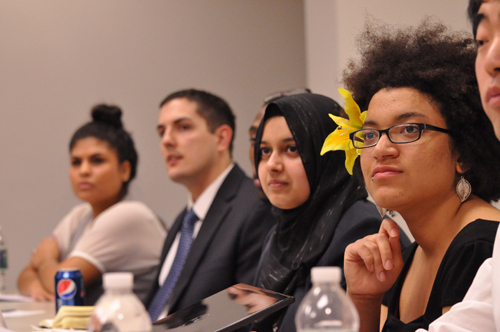 But defining exactly what diversity is as just as important, panelists said. "When i hear diversity in the media I struggle to define weather it's objective or subjective." said Leena Saleh, a DePaul undergraduate journalism student who works with the DePaul Documentary Project & United Muslims Moving Ahead. "What about a story that has to with a minority American? I haven't seen an improvement in that, it's been the same since the 1970's." Saleh was one of six panelists who participated in the forum, which moderated by Karen Kring of the Association for Women Journalists Chicago. The Korean Student Organization, Act Out and the Inter-Tribal Student Organization co-sponsored the event, which was live-Tweeted using the #SPJchat and fielded questions from a social media audience. One of the questions from Twitter asked how mobile media could change how we cover underserved neighborhoods. Lenox Magee, a ChicagoNow blogger and editor-in-chief of 360 Magazine, said social media tools such as Twitter and Facebook help media and citizens connect with underserved communities. "We can now reach others directly and ask questions now," he said. Magee raised the question that journalists often must deal with when covering the news: what's newsworthy vs. whose story is more important. He pointed to a recent blog post he wrote about the Chicago mayoral election entitled "Confessions of a Bi-Curious Voter." In the post, Magee explored which mayoral candidate he should vote for based on the many ways he is seen: his ethnicity, sexuality, gender, etc. 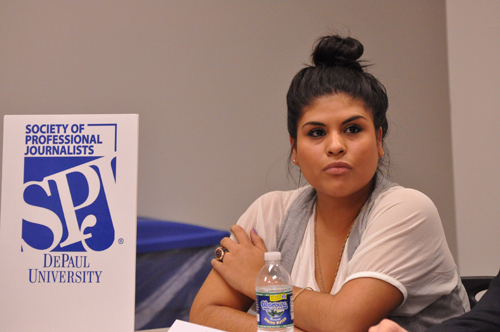 Brianna Montague of Act Out was among the most outspoken panelists. She said what "you omit is just as important as what you say in media coverage." "Do we actually want diversity or do we want something else and we call it diversity," said Montague, a DePaul political studies major. The theme of the discussion was that there must be a change within the newsrooms to better reflect their audiences. That not only means hiring a more-diverse staff but also covering more stories in diverse neighborhoods. Kristen Aguirre, a DePaul graduate journalism student, remains hopeful that diversity can be achieved. She said she grew up in a prominently white neighborhood and became a journalist out of a love for writing and a desire to learn more about her Latina culture. "Will we reach a point, maybe 10 years out, where diversity isn't an issue in the newsroom any more?" she said. "It will be there."